It’s easy to think that whitening your teeth on your own is a cost-effective solution to professional teeth whitening from your dentist. In fact, at-home teeth whitening practices, unless directed by your dentist, are either not as effective as professional treatments or are too strong for safe use. The advantage of professional teeth whitening is that your dentist can determine exactly what you need and how often you should whiten your teeth. If you’re currently participating in the following dental myths listed in this article, it’s time to consider seeing your local dentist in Malta. There has been some misinformation going around about how baking soda will whiten your teeth. This is not true. In fact, using too much baking soda in your mouth can disrupt the good-to-bad bacteria ratio in your mouth, which can lead to other oral health issues if baking soda is consistently used. The use of hydrogen peroxide in large doses is dangerous for your health. Hydrogen peroxide has been shown to agitate free radicals when it comes into contact with your skin. These are the same free radicals that if agitated cause the aging of living tissue. While these products do have whitening chemicals in them, they are too weak to whiten your teeth effectively. You may or may not see a shade or two difference after frequent use, which can cost you as much, if not more, than seeing your dentist for professional teeth whitening. Each whitening gel has a different amount of whitening chemicals. This means that not all gels are the same. In fact, the whitening gel your dentist uses for professional treatment is quite different than the gel you get at your local pharmacy. Also, professional whitening gel tends to be stronger than any over-the-counter product. A stronger whitening gel may speed up the whitening process, but it’s not necessarily the best choice for you. Everyone’s teeth are different. The strength of the whitening gel along with the time the chemicals are in contact with your teeth matter. Depending on your smile and your needs, how much whitening gel your dentist applies to your teeth may vary. Unfortunately, your teeth stain due to your oral lifestyle habits. For example, if you drink a lot of coffee or smoke consistently, your teeth will see a quicker rate of staining than someone who does not participate in either of these activities. Whitening is a strong, temporary way to brighten your smile in the face of staining. Touch-ups are necessary to keep your teeth shining bright. Until your teeth are fully mature, you do not want to whiten them. Children’s teeth are more susceptible to damage when the whitening chemicals come into contact with their enamel and oral tissues. Even teenagers should consult their local dentist in Malta before considering any teeth whitening products. Ready to feel confident while you smile? 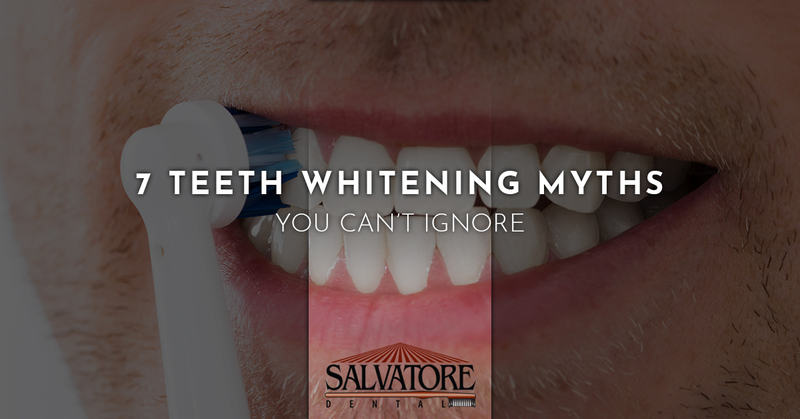 Contact Salvatore Dental today and schedule your professional teeth whitening appointment today!